EA GUILDFORD PARTNERS WITH LOCAL CHARITY. In April, employees from EA's Guidlford office spent a day volunteering with long time community partner, Halow. 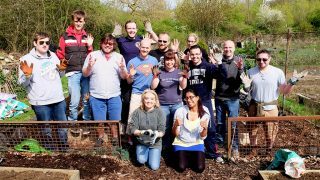 In preparation for the growing season - somewhat accelerated by the recent spell of warm weather- the seven-strong EA volunteer team joined Halow youth, their support and staff for a day of soil preparation, weeding, planting and the construction of new raised beds. Halow's Social Activities Assistant shares, "Halow relies on its team of volunteers to support our work in the community and its activities with young people. The EA team was fantastic! [They] really made a difference...and were a big help. Halow's young people enjoyed meeting the EA team and working alongside them on the plot - particularly when it came to planting the vegetables." Thank you to the EA volunteers for your generosity and support of your community!